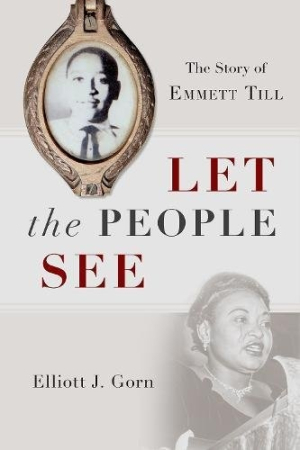 Let the People See is an engaging, comprehensive account of Emmett Till’s murder and its aftermath. In 1955, fourteen-year-old Emmett Till supposedly flirted with a white woman in Mississippi, and he paid the ultimate price for the accusation. His lynching and subsequent open-casket funeral exposed the harsh realities of American racism. More than sixty years later, Till’s story is a symbol of racial inequality in the South, but there was so much more about his life, his death, and his impact that is not known. Elliott J. Gorn’s Let the People See changes that, bringing to life Emmett, his mother, and the events that impacted a nation. This account of the murder, the trial, and their aftermath encompasses every element of the tragedy from start to finish. From illustrating racial tensions present in Mississippi to sharing the history of Till’s family multiple generations back, Gorn misses nothing. From all this information, heartbreaking truths come to light. For example, the trial where Till’s murderers would be acquitted took place in Sumner, a town which carried the slogan “A Good Place to Raise a Boy.” In addition, striking parallels of political rhetoric now and then paint a chilling portrait of stagnant progress. The book’s lengthy bibliography points to immense research. Let the People See meticulously depicts the setting and the era—both crucial to understanding Till’s story, though sometimes there is an overload of information that pulls attention away from the main account. Emmett Till is not to be forgotten. As racially motivated violence and death still haunt American communities, Let the People See reminds us all both how far the country has come and how much farther it has to go.